The Hearts boss saw his team defeat Auchinleck Talbot 4-0 at Tynecastle. Hearts' Scottish Cup victory over Auchinleck Talbot came at a cost as Craig Levein revealed that Michael Smith could be out for up to six weeks with a thigh injury. The Jam Tarts saw off Juniors opposition Talbot with a 4-0 win to reach the quarter-finals of the competition but injury to Smith was the only downside for Levein. Revealing that the defender had suffered a thigh tear, the manager said that a scan on Monday could bring bad news. Levein said: "The big downside was Mick. He was as professional as ever today and his performance was very good. But he's torn his thigh muscle and he will be getting scanned on Monday. "We don't know how long he will be out. It depends how bad it is - whether it is a grade 1, 2 or 3. But it could be six weeks out. "It was his standing leg when he passed the ball." Goals from Christophe Berra, Demi Mitchell, Steven MacLean and Aidan Keena secured progress for Hearts in a game where all the expectation was on the home side. 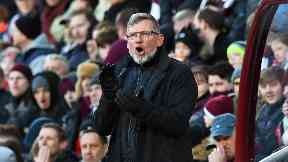 "It was a bit of a no-win situation for us, but I was pleased with our first-half performance," Levein said. "We didn't quite play at the same intensity in the second half. We stopped playing the easy balls and tried to do something more difficult - but it didn't cost us and we are through." Talbot boss Tommy Sloan had no complaints about his side's performance and took all the positives from their cup run and the Tynecastle tie. "It's strange but even in the first half, when we were taking a bit of a doing, I was still enjoying being here," he said. "We've had great times from the moment the draw was first made in July and we've gone a round further than we've ever done before. "This is what we want to be doing, where we want to be playing. I hope the boys take the positives of this into the other competitions we'll play this season. "Hopefully, we'll be back in this competition next year and we can go on a run again."